Daytime running lights | What Car? Scandinavians have long used clever lighting at home to lift the gloom of dark winters and grey days and in the late 1970s, the Swedes were the first to make daytime running lights (DRLs) compulsory on their cars. Other European nations followed, and from February 2011 all new cars sold in the EU will have DRLs with light-emitting diodes (LEDs). Quoting research from countries where DRLs are already compulsory, the European Commission (EC) says that they could reduce fatal accidents across the EU by 3-5%, simply by making vehicles more visible to other road users. That research is supported by the USA's IIHS (Insurance Institute for Highway Safety), which claims that certain types of daytime accidents can be slashed left-turn crashes went down by an astonishing 37% in Denmark (where people drive on the right) in the first 15 months of mandatory DRLs, for example. With old-style halogen bulbs, DRLs increased a car's fuel consumption by up to 1%. Yet modern LEDs consume far less energy: Audi, the first to market an all-LED front lighting system with its R8, claims its LEDs are four times more energy-efficient than comparable halogen bulbs and that 'by 2018, LED technology should be about eight times more efficient'. Developed to last the life of the car, LEDs also consume less energy than xenon bulbs, and are less likely to dazzle oncoming drivers. It's easier to integrate LEDs with adaptive lighting, automatic dipping and variable-light distribution technology, and ultimately they'll be used more widely for entire headlamp systems. Daytime running lights could make the UK's roads safer, says journalist Farah AlkhalisiCar confusion? Car designers aren't complaining, though the use of LEDs frees them from the constraints of conventional headlamp design. 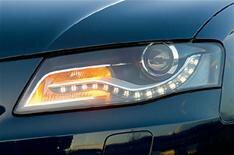 Neither are headlight suppliers' marketing departments complaining: we all instantly recognise BMW's 'corona rings', and its latest horizontal rows of LED DRLs are equally distinctive. Wanting to ape these distinct designs, every boy racer will want to fit a strip then LEDs won't be exclusive. Never mind: fibre-optic lighting, as seen in many recent concept cars, is nearly ready for the road. Tell us your thoughts on daytime running lights by emailing us [here](mailto:whatcarpoll@haynet.com?subject=Daytime running lights).